Flexible magnets are made of metal powder in a slurry of flexible material. This mixture is extremely abrasive and tears up the equipment throughout the entire manufacturing process. 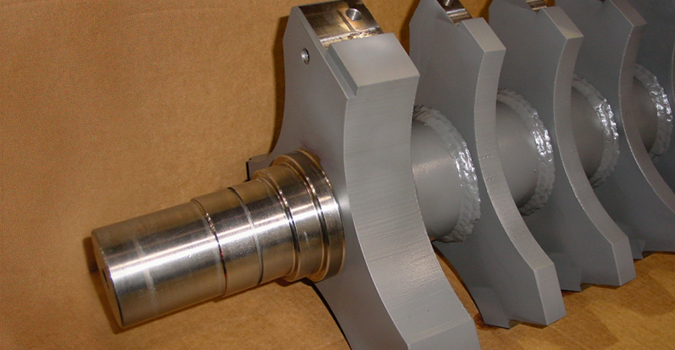 Pulverizing hammers, screens, mixing chambers, mixing rotors, rollers, and many other components can be coated to substantially improve their wear life. In order to improve the service life of magnetic material manufacturing components, a hard, extremely wear resistant coating is required. CTS has selected a material that includes tungsten carbide – one of the hardest materials known, and chromium carbide – a hard material known for lubricity. These materials are combined with Nickel for a ductile matrix. We have used CT2150-2 Tungsten Carbide Chrome Carbide Nickel coatings for some several years in these extremely severe wear applications and it has performed admirably. The coating is applied using High Velocity Oxygen Fuel technology producing hard, extremely abrasion resistant coatings that outwear chrome plating by 10 or more times. One maker of flexible magnets has replaced chrome plating with our CT2150-2 Tungsten Carbide Chrome Carbide Nickel, going from replating every six weeks to components lasting over a year. Since our initial coatings, many other components – some that could not be chrome plated due to their configuration – have been coated successfully. To learn more about CTS capabilities, contact us to consult with a CTS Engineer and we will respond within 24 hours, or download our whitepaper to learn more about the thermal spray process.